official birthday of the City and the Mission. 10:00am Eucharist in the Old Mission, commemoration ceremonies following in the Cemetery/Garden. All are welcome. Call for information (415) 621-8203.
near the Upper Market/Castro/Mission Districts of San Francisco. Mission Dolores Elementary School, founded by three Sisters of Notre Dame de Namur in 1856 on orchard land surrounding Mission San Francisco de Asis, the oldest mission church in California. On June 29, 1776, just a few days before the Declaration of Independence was being signed on the opposite coast, the first Mission Dolores site was being dedicated a half block from the corner of 16th & Valencia. The California historic marker shows it sited on the Lake of the Lady of Sorrows or the intersection of Camp and Albion. When the 198 Spanish priests, soldiers and Mexican settlers led by Lt. Don Jose Joaquin Moraga made this site of the Mission the first public building they named it San Francisco de Asis but the people chose to call it Mission Dolores. Fairly close to the geographic center of the spectacular landscape where the City and metro area of San Francisco began, the church moved two inward to the base of Liberty Hill 15 years later. The 114 by 22 foot Mission Dolores building is the San Francisco Bay Area's oldest surviving structure, even the 1906 earthquake which took down the neighboring basilica did not harm the Adobe building built by Christianized Ohlone Indians. Constructed of thousands of adobe bricks arranged in a block 10 feet thick and set on a foundation of rock four feet below the surface the building is most distinguished by its brilliant facade of whitewashed adobe bricks. The sixth of 21 Spanish mission churches ordered built by King Carlos III of Spain to better lay claim to the mythical land of California. The first mission was established in 1769 in San Diego and the last built in Sonoma in 1823. The two entrusted with the ambitious project of bringing civilization to California were Father Juniper Serra and Lieutenant Juan Bautista de Anza. The missions were each a day's journey apart and were linked by El Camino Real or King's Highway. In the grassy median strip center of Dolores Street, just outside the main entry where authorities wish to erect statues commemorating the birth of the Bay Area, is a Mission Bell which at one time could be found all along the historic El Camino Real. For thousands of years, the native Ohlone had hunted the Bay's local wildlife and, from their nearby encampments, gathered tule reeds and other creekside plants to build boats, roofs, mat and baskets. Overnight the people were asked and then required to leave their way of life for a repressive agricultural labor system. 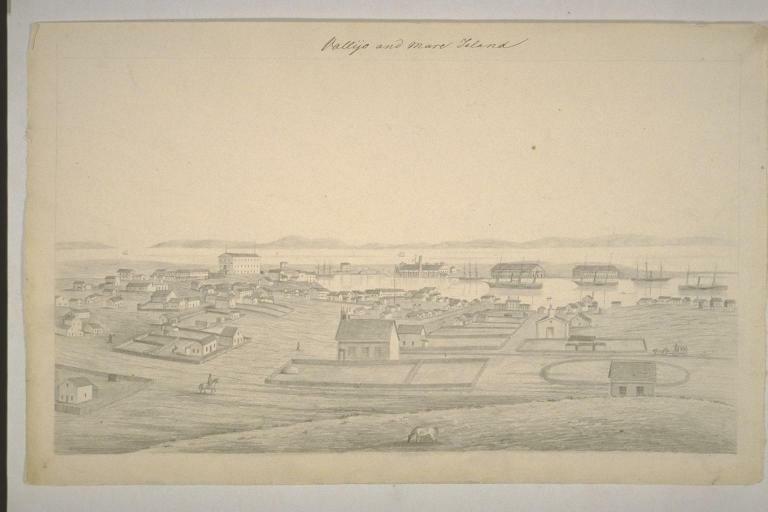 Olhones on the Bay as sketched by Russian sailor. The coastal area stretching from San Francisco to Monterey Bay was home to forty or so culturally diverse native tribes now known collectively as the Ohlone This name was given by the the Miwok Indians who lived in North and East Bay and it has in recent years replaced the Costeños name originally given by the Spaniards The Olhone enjoyed an easy life as a mobile society of hunter-gatherers since the region provided abundant game, waterfowl, shellfish, native plants, and fish. The are said to have invented the double headed paddle. Mission Dolores never met the expectations of its founders: A total of 6,536 Indians and 448 Mexicans were baptized there, while 5,187 Indians and 150 Mexicans were buried in the cemetery next door. The coastal fog made agricultural crops marginally successful and the Indians were frequent deserters. How the Jesuit priests coped with this problem is the source of continuing controversy. As through most of the Americas, it was the European diseases, which was responsible for the elimination of most of the native population. In the 77 years of Spanish and Mexican control of California, the native population declined from about 300,000 to 150,000. There were considerable problems with disease at Mission Dolores. In 1817, the future Mission San Rafael Archangela was opened in San Rafael as a hospital mission where the Mission Dolores inhabitants could enjoy the recuperative elements of sunshine. Manuel Valencia (1856-1935). Mission Dolores, n.d. Oil on canvas. Gift of M. Calder. California Historical Society, Fine Arts collection, FN-31963. The Mission was returned to the Catholic Church in 1857. In 1863, President Abraham Lincoln signed an Act declaring that all of the 21 missions in the California mission chain would become the property of the Catholic Church and have remained so since that time. Today the Mission greets 200,000 and 15,000 school children each year. The striking designs in the unusual ceiling are the original Indian designs in stripes of mustard yellow, gray, white, and red. The redwood ceiling beams are lashed together with rawhide thong. The church is decorated with many icons some which came from Mexico but others made of redwood must have been made at Mission Dolores. Mary the mother of God can also be experienced as the Lady of Sorrows Through her own experience of sorrow she was taught the sympathy which enables her to comfort us her children in all our afflictions. God has gaven her a mighty and a sympathetic heart for this great task. Another reason why the Mission neighborhood refers to itself as the Heart of the City and along with surrounding neighborhoods is proud to count as residents some of the most the most liberal and progressive thinkers and voters in the state. "Those who implore her aid in virtue of her sufferings may confidently expect her assistance." Our Lady of Sorrows is traditionally depicted in art dressed in black with seven swords piercing her heart. "On Calvary we can contemplate two altars: one in the body of Jesus, the other in the heart of Mary. Jesus immolated his own flesh: Mary immolated her own soul." Our Lady of Sorrows by Saint Benedict Center Slaves of the The Immaculate Heart of Mary Many beleivers will say seven Hail Mary Mother of God and you may believe that the Blessed Virgin will not leave your petition unanswered. In mysteries of the Rosary there are seven of her sorrows that have been chosen for special veneration. Mary Page presents the second of five Lenten meditations. This devotional traditions that have evolved over the centuries which link Mary to the Passion, Death and Resurrection of Our Lord Jesus Christ. ``When I stand outside Mission SanJose, I tell people that it's true that the way of life of my ancestors no longer exists because of the presence of this colonial institution,'' said Andrew Galvan, an Ohlone Indian who is helping raise money to preserve the missions. ``On the other hand, when I go inside I see the place where my great-great-grandfather was baptized. ``I find myself in an odd juxtaposition,'' said Galvan, who is an archaeologist interested in the 3,000-year history of his people. ``These missions were built by Indians and for Indians,'' Galvan said. ``We are all connected to these missions, as a spiritual home, as a symbol of the survival of a people, or as a symbol of oppression. "The Spanish crown decreed in the 1760s that the Indians were to be rounded up, baptized into Christianity and their culture destroyed. It was the same policy that Spain had followed in eradicating the complex and advanced cultures of the Mayans, Incas and Aztecs in Latin America.....Additionally, the act must also require that funds be set aside for research to be conducted on mission grounds for the purpose of determining if mass graves of Indians exist within them. " Only two of the 21 missions are funded by a government agency, Ameil says. All of them are short of money. ``There is no one entity looking after the long-term restoration and preservation needs,'' he said. powder- post beetles, an extremely tough pest. The beetles were busy chewing away at irreplaceable works of art, including statues of the saints brought from Mexico by sea in 1796 and 1810. 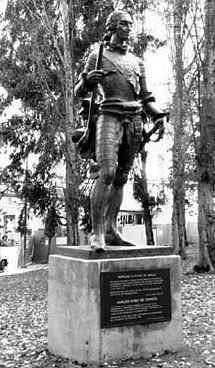 05/30/2000 - Chronicle Early California Statues Going to Mission Dolores With strong references to the displacement of Latins in the Mission, Supervisors took a lot of incoming about taking note of one its more important pieces of history. "Anza's character may be read in the pages of his diary. He was by nature simple and kindly, responsive to the call of duty and true to the "chivalrous traditions of heroic Spain." It is not easy to estimate the value of the services of this gallant soldier, and the monument erected in San Francisco to the Pioneers of California is incomplete without his name." King Carlos III was a 1976 bicentennial gift to the city from Spain's current king, Juan Carlos . The King of Spain from 1759 to 1788, was the most dynamic of the Bourbon monarchs. A product of the Enlightenment, his imprint is everywhere in the architecture and planning of modern Madrid. It was his initiative to civilize California by financing the founding of the 21 Missions and military bases on West Coast. The need to resist the territorial ambitions of Imperial Russia was the behind the initiative. All such requests will be referred to the Archdiocesan Archives or the Oakland Family History Center. Featuring histories for each of the twenty-one California Missions, beautiful photographs & sketches, plus authentic mission music written by the Spanish padres and the Native Americans who lived and worked there. The chain of 21 missions along California's El Camino Real ("The Royal Highway") represent the first arrival of non-Native Americans to California. Life for the California Native Americans was forever changed. In addition to Christianity, the missions brought many other things to California such as livestock, fruits, flowers, grains and industry. California Mission Studies Association or ca-missions.org For the Study and Preservation of the California Missions, Presidios, Pueblos, and Ranchos and Their Native American, Hispanic, and Early American Past. - Registered Landmark Number One ...." Interior and exterior photos of present-day mission structure, historical photographs 1816-1906, 2 floor plans and elevations done by the WPA for the Historic American Buildings Survey, some historical data, and visitor information.